Yesterday I had breakfast with my brother, his wife, and one of our former business professors who is still a great friend. The service and the food were pretty good, with me relishing a bowl of oatmeal and dry wheat toast as penance for my holiday splurge. After the plates were picked up and the check was delivered and paid, there were no further offers for coffee refills even though we sat there and talked for another hour midst a sparse crowd in the restaurant. I assume once our waitress delivered the check she considered her work at our table to be done. Then there is this skill they teach in food service school of being able to avoid eye contact with customers. She was flawless but I'm sure also clueless. Be sure to stay engaged with your customers until they are ready to leave, whether it's your store, your cell phone, or your website. Don't squander a good first impression with a fumble on the one-yard line. My friend Holly Buchanan has announced her awards for Marketing to Women in 2007. As the whole media landscape changes with mass media losing its mass to scores of micro-channels, it's important that marketers not get overly focused on the media placement issues of communication. Getting the right message, telling the right story, understanding your audience (gender, personality type, etc. ), and creatively packaging that right message - these are still the priorities for marketers. Dealing with the massive shift in media is but another added opportunity for stress and growth. 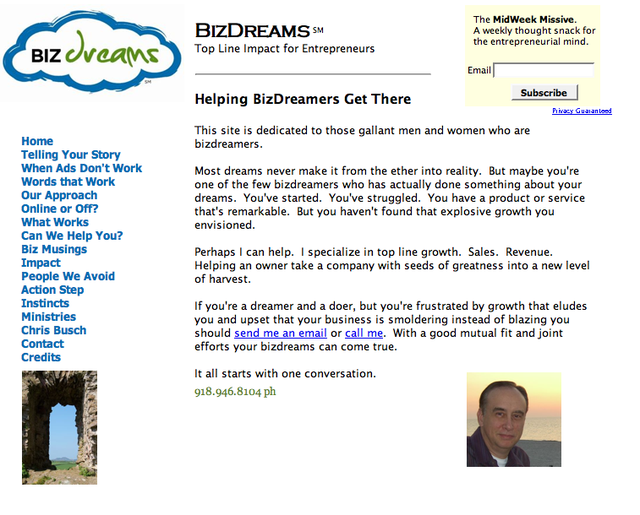 The rudimentary BizDreams 1.0 site is available for your inspection. I'd be interested in your feedback. Like all sites, it's a work in progress.